The state of Nevada enacted Senate Bill 308 (SB 308), which aimed to amend the prior law on the books and increase the minimum insurance limit requirements that every driver is required to carry in the state. The new law goes into effect as of July 1, 2018. As of this date, the new minimum insurance limits are as follows: $25,000.00 per person; $50,000.00 per accident for bodily injury liability; and $20,000.00 for property damage liability. The limits will likely be referred to as 25/50/20. Currently, Nevada state law mandates drivers to carry $15,000.00 per person; $30,000.00 per accident; and $10,000.00 for property damage, commonly known as 15/30/10. Nevada is actually one of a mere six states that remain that required such low limits of vehicle liability coverage. Only one state - Florida - requires less coverage from its drivers. Because there will be more coverage, insurance rates across the state of Nevada will increase. If you already have more than the new minimum coverages, it should not affect your premium (though insurance companies may raise their rates anyway). Because each insurance company will have different premiums, it is best to obtain multiple quotes from several insurance carriers. If you are a victim of a Nevada car accident and suffer a personal injury in the collision, the mandated increase in insurance coverage is one way to better protect the injured. Nevada is one of the top 10 states in America that is seeing a trend of increased car accidents over the years. There are several factors that may be contributing to this including distracted drivers and pedestrians, decriminalization of marijuana - both medicinal and recreational, increased traffic congestion, and insurance fraud. With a steady rise in car accidents in Nevada, the likelihood that you may be injured in one also goes up. Presently, the 15/30/10 minimum liability coverage requirements typically do not cover damages to your car and/or medical expenses due to injuries. This leaves a victim to go after the at-fault driver’s assets, if he or she even has any. While a person forced to purchase 25/50/20 minimum car liability insurance may also not have assets that can be used to pay for monetary compensation of an injured victim, at least the insurance carrier has to pay out more money to the innocent party. The most common types of Nevada collisions are motor vehicle accidents (MVAs). In fact, statistics show that more people are killed annually in MVAs that other types of accidents. Las Vegas has the highest rate of MVAs in the entire state of Nevada. The most common types of car accidents where injury or death occurs include fender benders, t-bone accidents, rear end collisions, rollover crashes, head-on collisions, angled car accidents, failure to yield crashes, sideswipe crashes, and accidents resulting from distracted driving or driving under the influence (DUI) of drugs or alcohol. 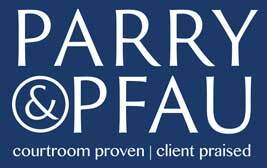 If you have been hurt in a Nevada car accident due to the negligence of another, contact the aggressive personal injury attorneys at Parry & Pfau. These skilled lawyers will fight for the monetary compensation you deserve. Click here today to schedule your initial case evaluation. As a personal injury victim, you have certain rights. This includes receiving monetary compensation for injuries suffered due to the fault of another. Is it Legal to Drive Without Insurance in Nevada? Like all other states across the country it is, indeed, illegal to drive without insurance coverage in Nevada. Is it Legal to Drive Without Insurance? Across the country, it is illegal to drive without insurance coverage. Nevada is actually one of a mere six states that remain that required such low limits of vehicle liability coverage. Only one state - Florida - requires less coverage from its drivers. A pair of bills introduced in 2017 by the Nevada legislature requires state health insurance, including Medicaid, as well as private health insurance plans to provide benefits relating to birth control. The Insurance Research Council (IRC) has found that over 12% of Nevada drivers are uninsured. Insurance companies aggressively pursue pre-existing conditions because virtually all policies completely exclude – or at minimum, reduce - payment of benefits for an injury based on an already existing medical condition. Newer PostIs it Legal to Hitchhike in Nevada? Older PostDo You Need a License to Drive a Moped in Las Vegas?